Offering the widest range of brush dispensing tips for use with syringe barrels, hand bottles, metering valves and robots. All tips are industrial grade safe for use to 100 psi air pressures and are certified silicone-free. Luer lock attachment for leak free dispensing. Use these double helix Brush Tips for spread applications such as glues and other materials. Brush is made of nylon. Supplied in a pack of 10 and also available in a single pack of one tip. High quality products for multi-use with all guns, pneumatic dispensers, valves and robots. Tip length of 1.5 Inch. Features a threaded luer lock hub for safe attachment. Soft bristle or hard bristle brushes. Silicone free and safe for use up to 100 psi. Suitable for use with primers, activators, coatings, oils, lubricants, adhesives, solvents, inks and paints. 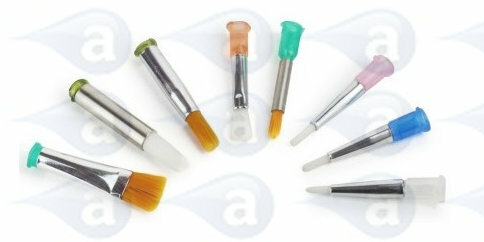 All brush tips are silver colour outer shaft with colour coded top. These tips ship directly from stock from our UK warehouse. 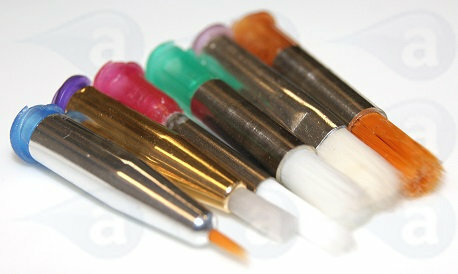 Select the large diameter tip for greases/ pastes. Select small bore diameter tip for watery liquids. Choose the brush width below. For use with all luer lock and luer slip syringes, air-powered dispensers, syringe barrels, bottles, fittings and dispensing metering valves. Silicone-free plastics ensure sensitive or specialist adhesives applied using these parts will not become contaminated in use. 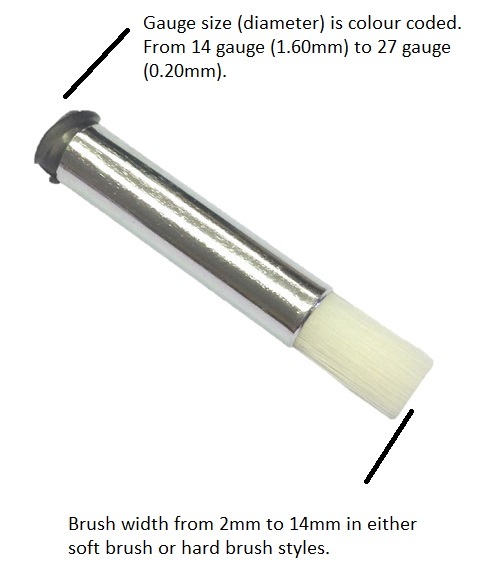 Select the length of tube required and the gauge size (diameter). Typical Applications:- Deposits of solder paste, deposits of solder flux, grease to bearings, potting components with epoxy, RTV to edge seams, silicone shots to bond products, gasket sealant repair, aircraft maintenance work, braze pastes, solvents, general adhesive applications.